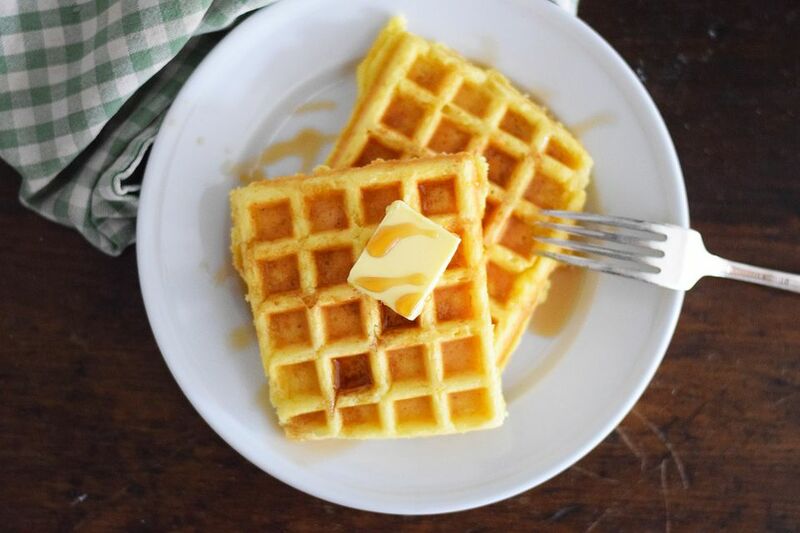 Whether from your sweet corn that you made for your summer bbq, or from your Thanksgiving leftovers, these waffles are the perfect recipe for your leftover corn! They are sweet, crispy, and savory. When they're slathered in butter and maple syrup, they hit all the right tastebuds and make a super satisfying and kid-friendly breakfast. Don't have buttermilk? Not a problem! You can substitute the buttermilk with whole milk and a little vinegar. It creates a very similar product and works well to create the perfect texture in these waffles. When prepping corn for this recipe, just make sure to chop it up, or blend it in the food processor. You don't want big chunks or whole kernels of corn in these waffles. Fresh corn on the cob works best, especially when it is in season in late summer and early fall. Just watch those fingers when grating the corn on the cob! These waffles store great in the freezer as well! Just let them cool completely after making them and pop them in a freezer bag. When you're ready for a waffle or two, throw them in the toaster on the 5-minute setting and you've got yourself delicious waffles on the table in a jiffy. They're also a great breakfast to take on the go. Slap some nut butter or jam on them and take them with you in the car, or the train! In a large mixing bowl, whisk together the flour, cornmeal, salt, sugar, and baking powder until completely combined. After the melted butter has cooled slightly, combine it with the grated corn, buttermilk, vanilla extract, and eggs in a large measuring cup, or bowl, and whisk until completely combined. Pour the wet mixture into the mixing bowl containing the dry mixture and stir to combine. Be careful not to over combine, but make sure the wet ingredients are completely incorporated with the dry. Heat your waffle iron on the highest setting. Grease the waffle iron with more butter. Pour the batter in batches into the waffle iron so that the batter covers the whole surface. Cook for 5-7 minutes, or until lightly browned and crispy. Place the cooked waffles on a cooling rack over a baking sheet and keep warm in the preheated oven while you finish making the rest of the batch. When all the waffles are finished, serve with salted butter and warm maple syrup.